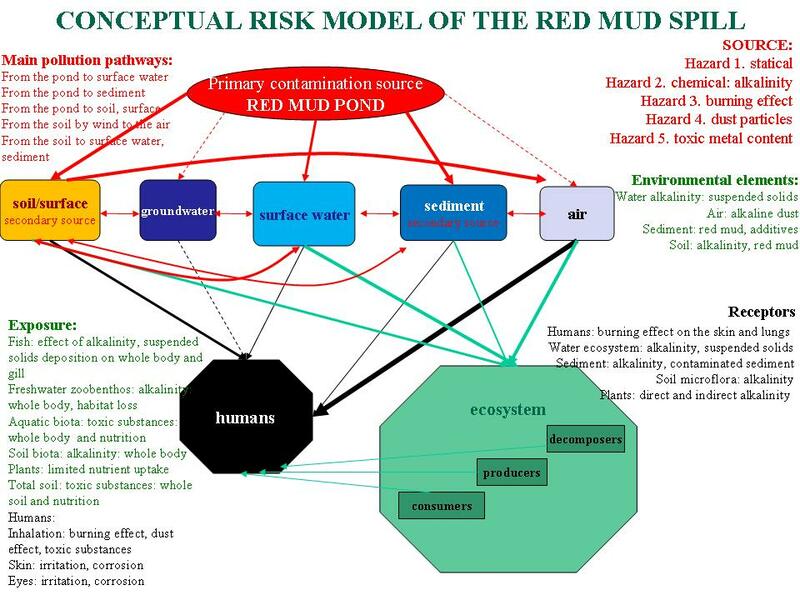 The risk model in the above picture shows the transport pathway of the red slurry released from the red mud pond after breach of the dike, the affected environmental compartments and the members of the ecosystem exposed to the contaminated environmental elements and the human receptors. The conceptual model gives also the hazards associated with the source, environmental compartments and receptors. The primary pollution source is the red mud from the storage pond. The red mud settled and collected downstream is considered to be secondary pollution source. Its removal is necessary to reduce the hazard. The arrows showing the transport pathways are symbolising the mass flow. Accurate calculation of these mass flows would give the dominant transport pathways and would allow making the comparison and would support decision making on the technological and economical aspects related to remediation. Qualitative and quantitative data collected for the conceptual model include historical and current data. Having all these data, risk assessment has to be done stepwise, checking the accuracy of the results continuously.